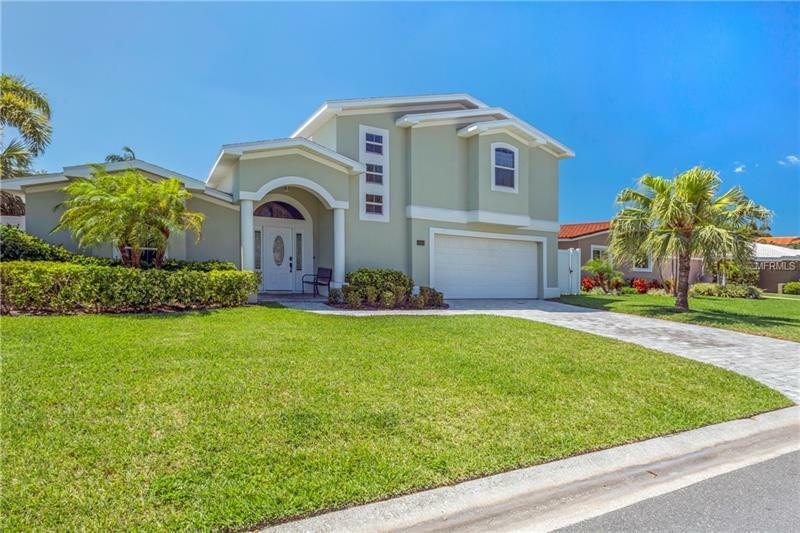 Do not miss this gorgeous waterfront pool home in Treasure Island. This 3 bedroom 3 bath 2 car garage has been recently remodeled and is move in ready. It features an open concept porcelain tile floors granite countertops and too many other upgrades to list. The kitchen is updated with shaker style cabinetry and stainless appliances. Off of the kitchen is a separate desk area and pantry with a full island/breakfast bar area. The first floor also includes two bedrooms and two bathrooms. There is bonus area on the back of the home which can be used as a studio or additional living area giving you a grand total of 3093 sqft of living area. Upstairs you will find the master suite with a walk-in California closet a balcony with a water view and a new roof to watch the beautiful sunsets a huge master bath with jetted-tub walk in tiled shower and his and her sinks for convenience. The fenced backyard has a beautiful pool with tiki hut. The dock was new in July 2016 and has a 9000 lb Deco boat lift and the canal is deep enough for sailboats. John's Pass is right around the corner offering quick access to the Gulf of Mexico shops and restaurants. Elevation Certificate is available. Do not miss this incredible opportunity to own your slice of paradise.